At her unassuming spot on Greenwood Avenue, Xiaoting “Ting” Guo shares the deliciousness of authenticity (hold the Mongolian beef). People come from Richmond, B.C., to eat at Little Ting’s Dumplings. Authenticity means a lot to Guo. “I love to eat,” she says. She’s from Anhui province in China, and her husband, Jason Xu, is from Hebei province. They met at university there; he’s now an architect, and she studied interior design. When they got to Seattle, Guo says, “We couldn’t find [an] authentic Chinese restaurant. For us, it’s American style. Some dishes, we’d never heard of … orange chicken, Mongolian beef. “In China, we never had that kind of dish,” Guo observes. “So it’s very funny for me: ‘Oh my god, it’s Chinese food!’ Sort of! Maybe!” She laughs. She and her husband found a modest little strip-mall spot on Greenwood at 145th. Her husband drew the happy-dumpling logo and the funny aliens-with-dumplings art for the dining room. Her father-in-law came over to help her master dumpling-making. Starting out, she was too slow for restaurant-level output. (“I’m professional now!” she laughs.) Her friends helped her clean the space, get supplies, even wait tables. They were also her first customers in January 2015, bringing along their friends. Most of the recipes come from her husband’s family, but the magical method of cooking the pan-fried dumplings and buns is that of her hometown. 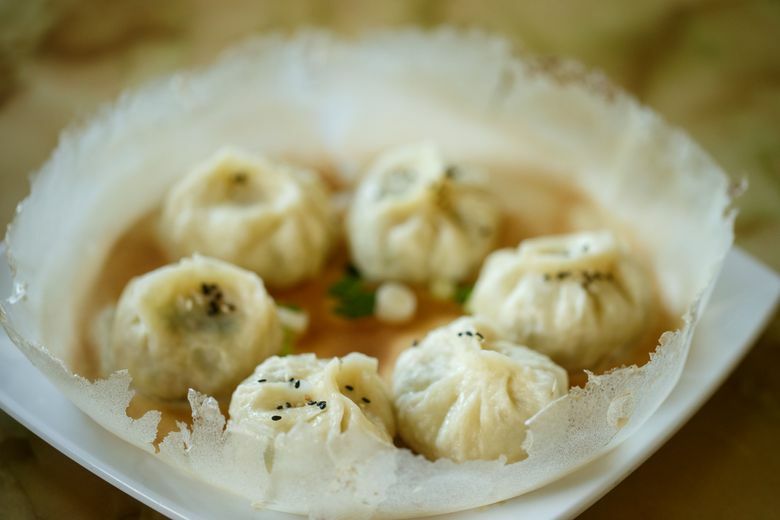 “It’s very simple,” she says — the water that’s first added to the pan to steam them has flour in it, and as it boils away, it leaves a very thin, very crispy, crepe-like, pan-shaped shell around the order of dumplings or buns. Then a little oil is added to fry up their bottoms, “so it’s crispy, it tastes good, but it’s not that fatty, oily,” she says. The fat, round baby-shrimp buns are from her hometown, too, made with tiny, chewy, salty dried shrimp, plus “spices, salt, sugar and chives — that’s all,” she says. “Handmade noodles in spicy sauce” are on-trend with turmeric and a mouth-tingling heat, made with the same dough as the dumplings; onion pancakes are cushy, if maybe unevenly salted. There’s lots more to choose from, but, needless to say, no orange chicken or Mongolian beef. Starting out with Little Ting’s, Guo says, she was unafraid. “I didn’t know how hard it is,” she laughs. After her friends, and their friends, got their fill, the restaurant grew terribly quiet. Time stretched out — a month and more. Slowly, curious neighbors, seeing the new sign, came to give the place a try. “Then they love our food, and they’re coming back, bringing friends.” Little Ting’s never advertised. “Never. Our customers are true customers,” Guo says with pride. In the beginning, she says, “I thought our customers would be Chinese people.” You’ll hear lots of Chinese spoken at Little Ting’s, but it’s a diverse, happy crowd. “It turns out,” Guo says, “actually, local people love the authentic Chinese food.” And it’s clear she loves sharing it.